Understanding the genetic basis of adaptive traits and how natural populations adapt to their environment, are fundamental problems in evolutionary biology. Colour polymorphisms are good systems in which these issues can be addressed. Philaenus spumarius shows a widely studied dorsal colour polymorphism with several described phenotypes. Variation in the occurrence and frequency colour phenotypes, as well as their maintenance across time, have been reported. Several selective influences have been suggested to play a role, but the mechanisms underlying the maintenance of this polymorphism are still poorly understood. Similar dorsal colour variation is observed in the other species of the genus, suggesting the maintenance of an old polymorphism. 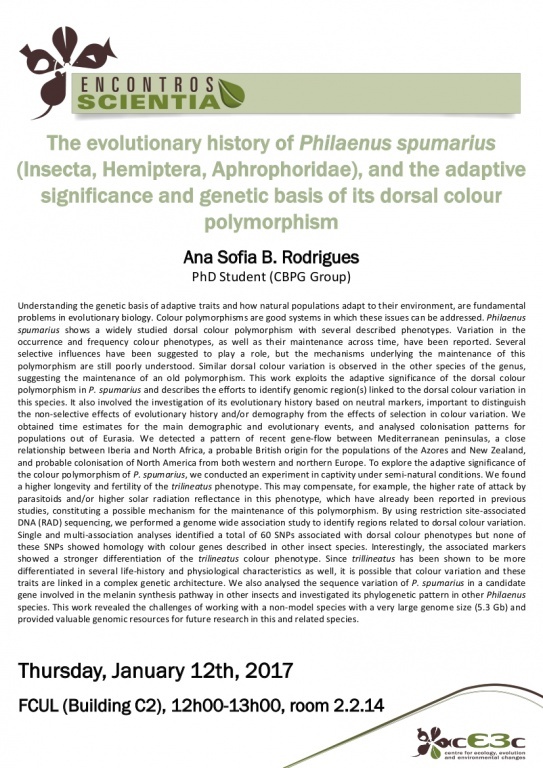 This work exploits the adaptive significance of the dorsal colour polymorphism in P. spumarius and describes the efforts to identify genomic region(s) linked to the dorsal colour variation in this species. It also involved the investigation of its evolutionary history based on neutral markers, important to distinguish the non-selective effects of evolutionary history and/or demography from the effects of selection in colour variation. We obtained time estimates for the main demographic and evolutionary events, and analysed colonisation patterns for populations out of Eurasia. We detected a pattern of recent gene-flow between Mediterranean peninsulas, a close relationship between Iberia and North Africa, a probable British origin for the populations of the Azores and New Zealand, and probable colonisation of North America from both western and northern Europe. To explore the adaptive significance of the colour polymorphism of P. spumarius, we conducted an experiment in captivity under semi-natural conditions. We found a higher longevity and fertility of the trilineatus phenotype. This may compensate, for example, the higher rate of attack by parasitoids and/or higher solar radiation reflectance in this phenotype, which have already been reported in previous studies, constituting a possible mechanism for the maintenance of this polymorphism. By using restriction site-associated DNA (RAD) sequencing, we performed a genome wide association study to identify regions related to dorsal colour variation. Single and multi-association analyses identified a total of 60 SNPs associated with dorsal colour phenotypes but none of these SNPs showed homology with colour genes described in other insect species. Interestingly, the associated markers showed a stronger differentiation of the trilineatus colour phenotype. Since trillineatus has been shown to be more differentiated in several life-history and physiological characteristics as well, it is possible that colour variation and these traits are linked in a complex genetic architecture. We also analysed the sequence variation of P. spumarius in a candidate gene involved in the melanin synthesis pathway in other insects and investigated its phylogenetic pattern in other Philaenus species. This work revealed the challenges of working with a non-model species with a very large genome size (5.3 Gb) and provided valuable genomic resources for future research in this and related species.